Last year I took a creative writing class at college. Though the story is fictional, it is based on several occassions which may be all too familiar to many of you. I hope you like the story. Please share the story or this blog with your friends. I like Monday mornings. This Monday was one of the best. A warm Fall morning made for a comfortable walk to my local coffee shop. 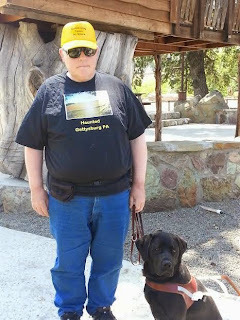 Beside me my guide dog plods along. We keep a nice easy pace. My fingers feeling the handle on his harness tells me when he is moving up or down on the sidewalk just in front of me. My dog knows this route well so there is little need of me to give directions. I can listen for clues as to where we are. A fading echo here lets me know that buildings are dropping back from the side walk, the scent of eucalyptus there tells me the main street crossing is coming up soon. The fading sound of traffic tells me that the lights are changing and it is almost time to cross the street. As the warm sulpherous aroma of coffee begins to fill the air I know we are near the coffee shop. "Find the door. Find." I tell my dog as his pace picks up. He knows this part of the walk is nearly done and he will soon lie beneath a table, or warm himself in a beam of morning sunlight. Going inside I order and pay for my coffee. I slip my dog a treat as we wait for my drink to be made. Taking up my cup as it is passed over the bar, I tell my dog to find the door again so we can sit at a table outside on the sidewalk. We find our way to a vacant table and chair. Setting down my coffee on the table I arrange my dogs leash so he can lay comfortably and sit myself down to enjoy the beautiful morning. "Hello. That's a nice dog." A woman's voice says. I turn to the sound of the voice. "Are you training him, or are you visually impaired?" "I'm sorry. It must be difficult for you." "You get used to things." "Your dog is just watching you all the time." I smile and reach down to stroke his head. "I like to think that he loves me but it's more about the treats that I carry in my pocket." I hear her laugh a little nervously. "Yes love is a very important thing." I hear the sound of a chair scrape on the floor, then the woman's voice is close beside me. "Speaking of love, do you know the word of Christ?" I reach out for my coffee cup. Beginning to feel anxious. I take a sip of coffee. "Knowing Christ in your life will allow you to see again." I wonder if she can see me rolling my eyes behind my dark sunglasses. "Christ cured the blind. It's here in his gospel." I nod slowly. Where the hell do I find them? I think to myself. They must crawl out of the woodwork when they see me coming. "Would you take this wonderful dog from me? "No, no. But you could see how beautiful the world is. See your beautiful dog." 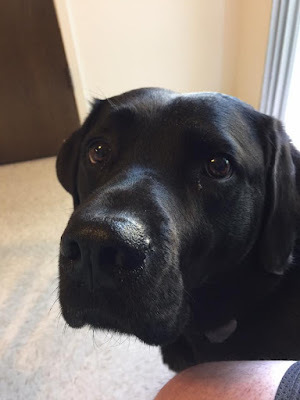 "He is a guide dog. A dog trained to guide a blind person. If I could see. I would not be blind. So he would not be here with me." "God would make a way for you to be together." "He did. He made me blind." I know this hits a mark and I feel her interest in the conversation wane. Perhaps she is thinking I am a lost soul or maybe not worth her efforts to save me. She coughs awkwardly. As I pick up my coffee again, I hear her footsteps walk away from my table followed by the scrape of a chair on the concrete sidewalk. I reach down again and stroke the soft ear of my guide dog. Now feeling awkward, I continue to sit. The conversation is still irritating me but I cannot leave my seat feeling that to do so would give her a victory. I begin to feel the warm sun on my hand as it rests on the woven wire table. Above my head the parasol snaps in a slight breeze. Cars continue to deposit customers at the coffee shop. Someone walks by with what smells like a toasted bagel. I feel my dog lift his head to take in the delicious aroma. My coffee is still warm and bitter and as I drink the last drop my thoughts drift away from the conversation. "Thank you Mike" and wishes me a good day. "See you next week Tony. I do love my Mondays here".